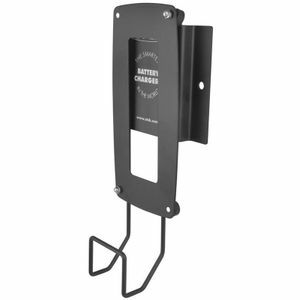 WALL HANGER has been specially designed to allow the larger CTEK chargers to be mounted on wall, ramp posts or hung off vehicle doors. WALL HANGER comprises a plate that can be attached directly to the back of the charger (screws provided) with a hook for safely storing cables. A bracket is provided that can be fixed to a wall or ramp post which the charger can then be hung on for storage or at a work station. The hanger has rubber feet to avoid scratching vehicle paintwork.